A big, scary word with a simple meaning -- any system attached to another system -- is automation. 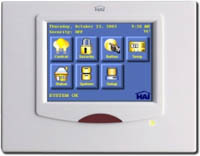 You have light switches, thermostats, speakers, security, internet, and more around the house. Make up practical ideas that work for you! Press a button to turn off lights, arm security and shut down furnaces . . . or, open the gate at night and have the lights turn on. The possibilities are endless! Home automation can provide access to everything from one location. From your kitchen, you may want to see the temperature outside, go online, see the cameras, activate a party scene and more. Do it all from one touch-screen!